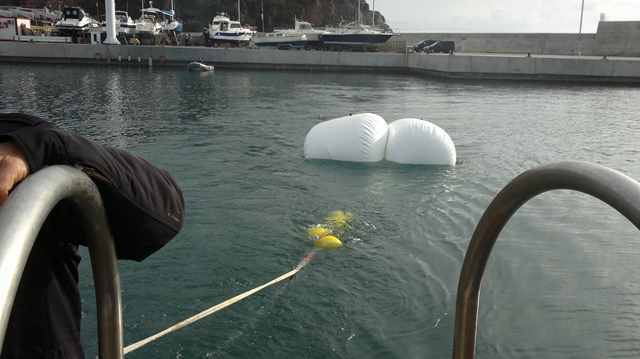 Successful deployment of a new mooring line at the Station OOCS from the "Dolores"
Lifting bags to hold the dead weight Mooring line on board "Dolores"
Triggering the mechanical release Mooring line deployed! 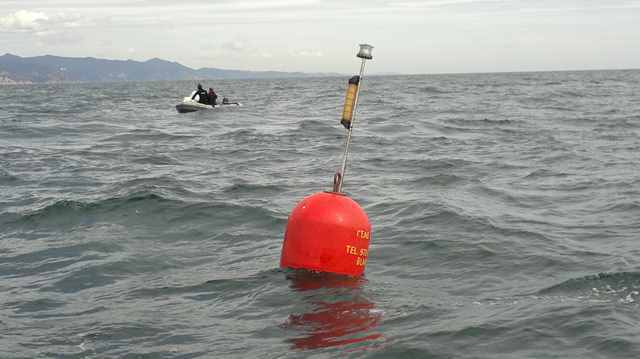 We are proud to announce that the last Saturday 16 March, 2013, a new mooring line was successfully deployed at the station OOCS (Operational Observatory of the Catalan Sea), at the Blanes canyon head, on board the CEAB's boat "Dolores". 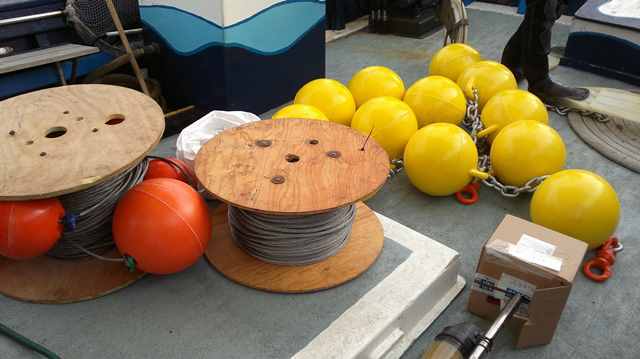 The new mooring line will hold the oceanographic buoy to be attached within weeks. The reason why we are so proud about it is because this maneuver has been carried out in the past only aboard mid-size research or fishing vessels (e.g. R/V "Garcia del Cid" or a bottom trawler). 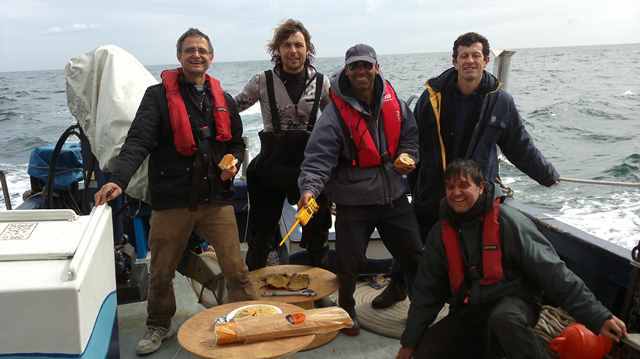 Now, for the first time in OOCS history, this task was completed with a much smaller (10.4 m length) wooden research boat: the "Dolores". 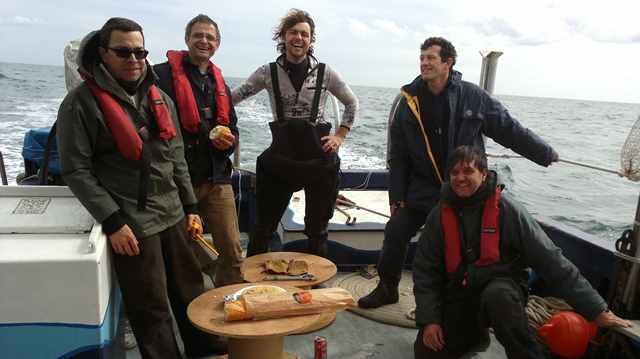 The mooring line consisted in a 250 m galvanised steel wire (8 mm diameter) to be anchored with a 2.5 tonnes dead weight. A number of mid-water floats were attached to keep the line vertical. A scheme representing the mooring line components is shown here, except for the fact that the line section initially made of polyester rope was now entirely replaced by anti-twist galvanised steel wire. We expect in this way to prevent a new cut, after cuts havingoccured twice in the past. 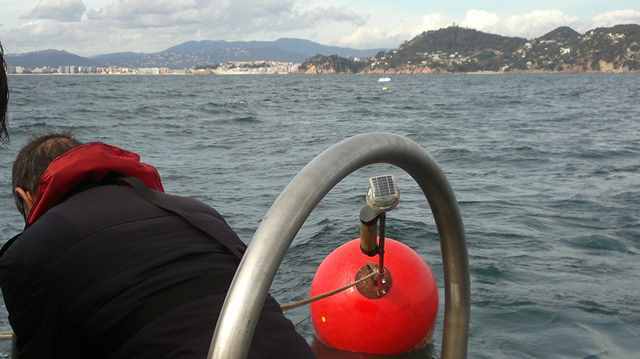 For this challenge, a working team consisting of OOCS members at CEAB, and local contractors in Blanes met and prepared the mooring line in a way that the dead weight was safely towed with the mooring line was assembled on board "Dolores" and safely deployed at the observation station. 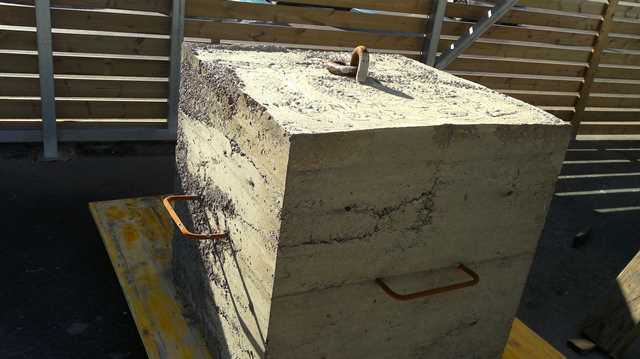 For the dead weight to be towed from the Blanes harbour up to the observation station, located five miles away, two heavy-duty lift bags were used to keep the weight suspended below the surface. The mooring line was deployed at 12:25 under slight sea conditions in a location a few meters far from the original deployment, at 41° 39.65' N; 02° 54.61'E, at de depth of 188 m over the shelf break in the Blanes canyon head. 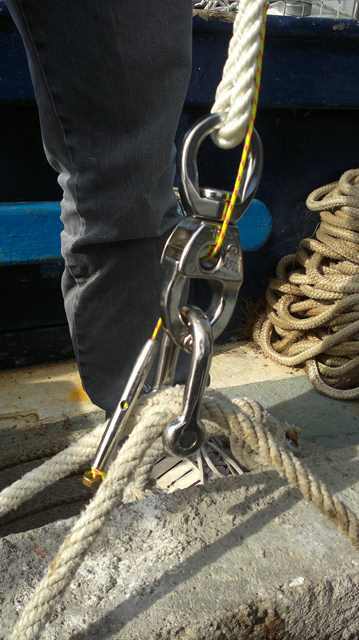 How to safely perform both the transport of the weight to the mooring place and the release of the weight at the target location at low coast ? Safe transport of the heavy weight with the (small boat) "Dolores" was guaranteed by assembling the mooring line on board so that the line length was always greater than the bottom depth during the cruise. The final length of the mooring line was 250 m length, thus allowing the boat to navigate over the Blanes canyon head reaching up to 230 m depth on the way to the deployment place. A submerged mechanical release (4.7 tonns holding capacity) connected the lifting bags to the dead weight. The way to safely trigger the release from the surface was a carefully meditated issue. The option choosen consisted in using a tiny rope connected to the release with a round metal end. 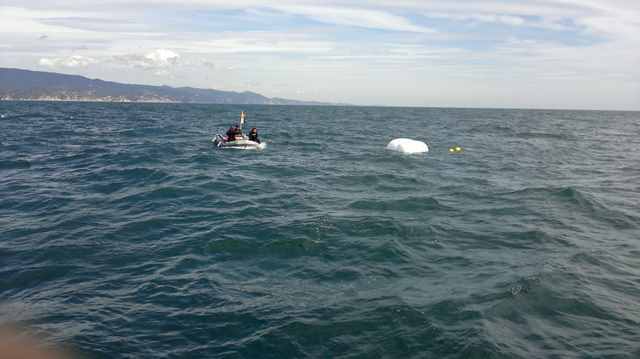 The other rope end was kept floating at the surface with the help of small floats to assure the release was accesible from on board to be triggered once on location. We now can say that we have learned about getting over a limited (though sufficient) resources situation (e.g. preventing us for using larger vessels or accessing more complex marine technology infrastructure), to keep the CEAB's coastal marine observatory operational. 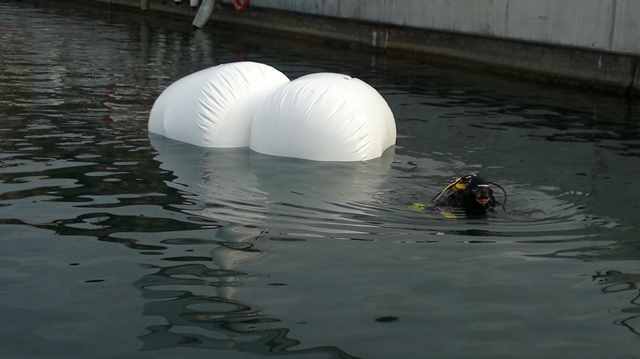 Close collaboration with local private enterprises (Electric Workshop at the Blanes harbour and dive center "Blanes-Sub") has been definitive to achieve success. We wish to thank Eduardo Muñoz and Ramón Muñoz (Electric Workshop at the Blanes harbour) and Dìdac Catalan (dive center "Blanes-Sub") for their valuable assistance all along the pre-deployment and deployment operations. Martin Schermuly (Erasmus student from the Fresenius University at CEAB), Manel Bolivar (Research Assistant at CEAB) and the "Dolores"' skipper, Ferrán Crespo, kindly assisted the different phases of the operation. Nixon Bahamón (OOCS' Coordinator at CEAB) was responsible for all the activities.